Join us for the second annual National Harbor World Peeps Eating Championship hosted by Major League Eating! At 2016’s inaugural Championship, Matt Stonie of San Jose, CA, ate 200 Peeps in just five minutes to set a World Peeps Eating Record. For mere mortals, one or two, or possibly a small cluster of Peeps, make for a quiet, sweet reminder of the Easter season’s promise of renewal and new life in marshmallow form. But not for Stonie. He ate like a man possessed by the promise of the Peep. He ate with a ferocity but also with a calm that belied that ferocity. His mind and body were in perfect harmony. 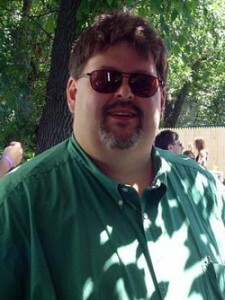 Geoffrey Esper would eat 160 for second place; Ms Juliet Lee, a resident of the great state of Maryland, ate 140 for third. Others ate less but all left happy. Peeps are delicious and that eating them in the early spring air in our nation’s Capital Region is a privilege, not a right. This is The National Harbor World Peeps Eating Championship. At the table or in the crowd—don’t you dare miss it! 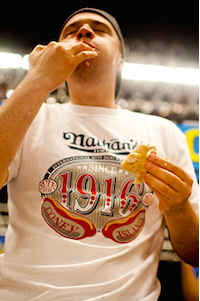 Carmen Cincotti ate 42 Nathan’s Famous Hot Dogs & Buns in 10 minutes to win the 2016 Washington DC qualifier in high style and he did so again shortly after at the 2016 Nathan’s Famous Fourth of July International Hot Dog Eating Contest. This we know: Dude can eat. 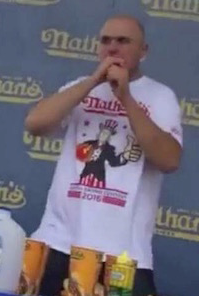 In his MLE debut at the CitiField qualifier for the 2015 Nathan’s Famous Fourth of July International Hot Dog Eating Contest, he ate 30 hot dogs and buns in 10 mins. 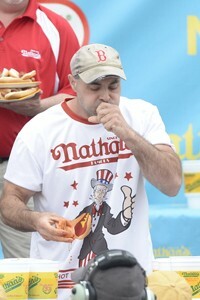 Two weeks later in Rochester, NH, he ate 30.5 hot dogs and buns for the win. At the 2015 Championship Finals, he ate 29.5. That’s a one-dog and bun standard deviation across three contests. Dude can eat. And dude is consistent. At 6-foot-9, he uses his considerable frame to full effect, his lengthy torso the perfect home for Nathan’s Famous hot dogs and buns and corn, as of press time. 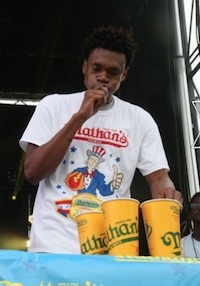 At the 2016 Nathan’s Famous Fourth of July International Hot Dog Eating contest, Oji ate 38 hot dogs and buns to finish in fourth. Shortly after, he won Kale Yeah!—The World’s Healthiest Eating Championship Presented By Healthy Options. Juan Rodriguez logged a string of impressive performances at the MLE table in 2012, most notably in the Slugburger (23.5 in 10 minutes), Gyoza (146 in 10) and Tamales (60.5 in 12) disciplines. 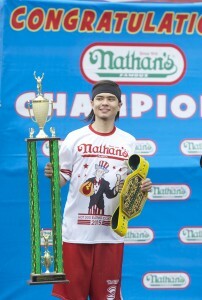 He ate an astonishing 22 Nathan’s Famous hot dogs and buns in his first qualifying attempt and MLE debut. Since making his MLE debut in 2008, Yasir spent five years on the circuit without a championship title to his name. Then it happened. On September 12, 2013, he ate 31.75 cannoli at Little Italy’s Festa di San Gennaro Cannoli Eating Championship for the win. His heart filled with light. His thoughts danced. His mind erased the years of trying and he could see only warmth and calm and peace. The next day he flew to Brunswick, OH, and ate in the Mapleside Farms World Apple Pie Eating Championship. Mr Ambs has a bright future in competitive eating. 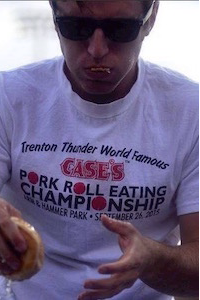 Since turning pro in mid-2016, he has distinguished himself in the chicken spiedie, chili and NJ pork roll disciplines, besting MLE veterans in the process. We look forward to his continued improvement. Matt “Sweet Tooth” Cohen has ling lurked on the fringes of competitive eating, the dark shadows. He has long been on MLE’s radar and has made a conferrable name for himself, most notably in the dessert disciplines, as his nickname would suggest. In 2015, Matt joined MLE and quickly made his mark, with strong showings in bratwursts and a money finish in MoonPies. More MLE contest experience will help Matt glean the most from his considerable talent in the months and years to come. Nasty Nate is undoubtedly the nastiest eater on the planet. 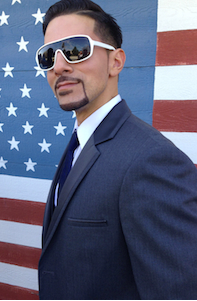 He is a Coney Island veteran of the Nathan’s Famous fourth of July International Hot Dog Eating Contest and cites tamales, burritos and tacos as his favorite competition foods. Legs started as one of the sport’s biggest fans. It was in 2002, when he visited New Orleans to watch Super Bowl XXXVI that he began competing in the sport he loved. Unable to secure a ticket, he opted to watch the game in the venerable Acme Oyster House, where he downed 34 dozen oysters in just over three hours, setting a new Acme endurance record. 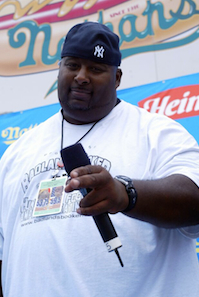 Legs returned to New Orleans in April for the 2002 Big Easy Eat-Off, choosing a major for his first official IFOCE contest. Crazy Legs downed 168 oysters on the half shell, hands free, for a decisive win. The rookie eater next consumed 18.5 hot dogs and buns in Coney Island on July 4th and secured the MLE pancake eating title when he downed 3.5 pounds of sourdough pancakes and six pieces of bacon as part of the Hibernation Cup. Wild BIll works in the computing sciences and prefers to eat sitting down during contests because he is a gentleman. 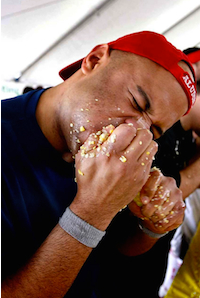 Major League Eating is the world body that oversees all professional eating contests. 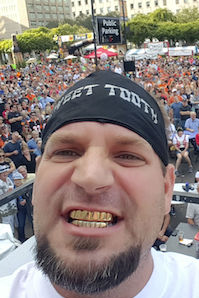 The ogranization, which developed competitive eating and includes the sport’s governing body, the International Federation of Competitive Eating, helps sponsors to develop, publiciize, and execute world-class eating events in all varieties of food disciplines. 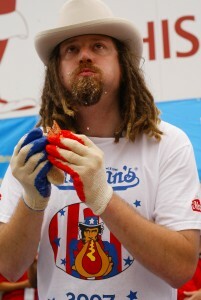 MLE conducts approximately 80 events annually, including the Nathan’s Famous Fourth of July International Hot Dog Eating Contest.